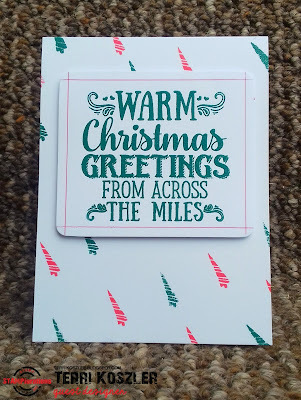 It's a exciting day today firstly because I am sharing 3 projects I've made with the new release from STAMPlorations Typografia Christmas range and I'm part of the blog hop. 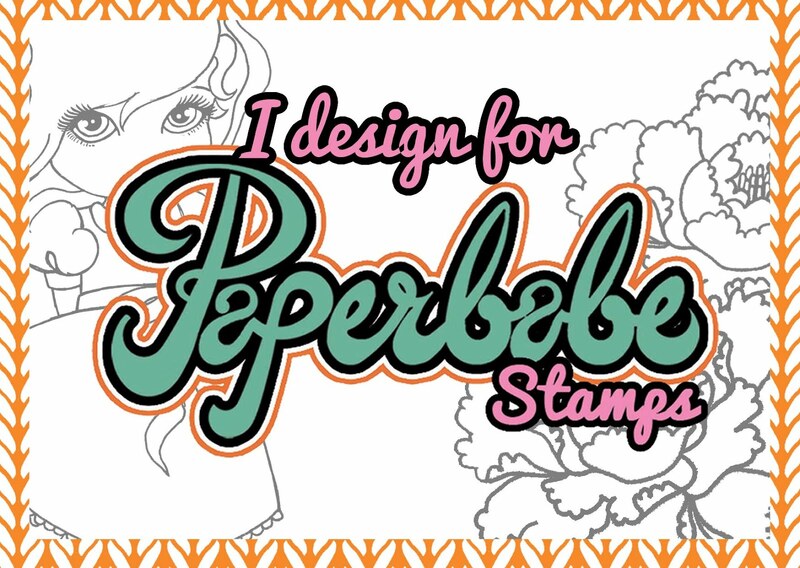 Shery has designed 25 amazing stamps, the sentiments are fantastic and the typeface is really cool. They can be used in modern or traditional projects and stamp perfectly first time. 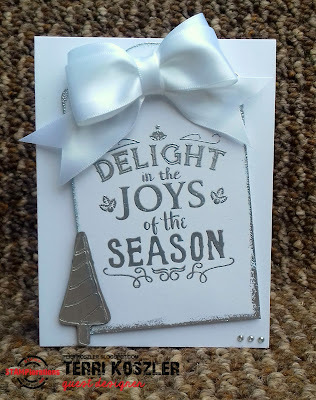 I've had lots of fun working with these stamps and they will definitely be featuring on my Christmas cards for friends and family this year. 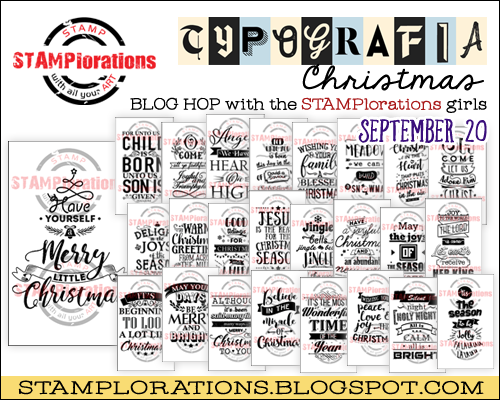 One commenter will win thier choice of 3 Typografia Christmas stamps. The winner will be randomly drawn from all comments left on the STAMP blog and participating designers' blogs. Winner will be announced on Tuesday, September 26. 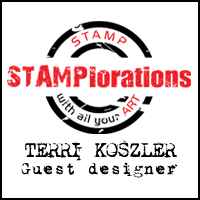 You can purchase the stamps from the store, they currently have 5% discount but if you use my DT Code you will get a 20% discount - Use>>>>>> STAMPGIRLTERRI when checking out. 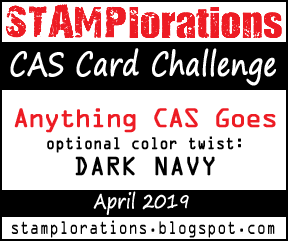 Lastly, I am really pleased to say that I have been asked to join the STAMPlorations team for another term, starting in October I will be with them for 9 months. Thanks for stopping by today, please let me know which card you like the best. love your CAS looks! white on white is my fav! Gorgeous! I esp like the gold one!! Love your metallics and whites. So very elegant! That white bow is stunning. Absolutely adorable and elegant cards! These are all awesome but that gold embossed one really looks elegant and impressive, wow! and the backgrounds blend in. So simple and sooooo beautiful! The beautiful simplicity of these cards really let the awesome sentiments shine! Love the last one in the gold; so elegant looking! 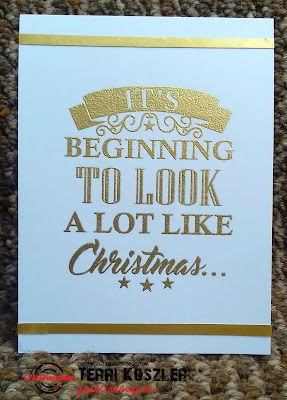 All three cards are beautiful but the silver and gold embossed ones really caught my eye. The silver design with the gorgeous bow is so elegant! Absolutely gorgeous cards ! The color combos you choose are my favorites for Holidays cards. So very pretty! Love the metallics! 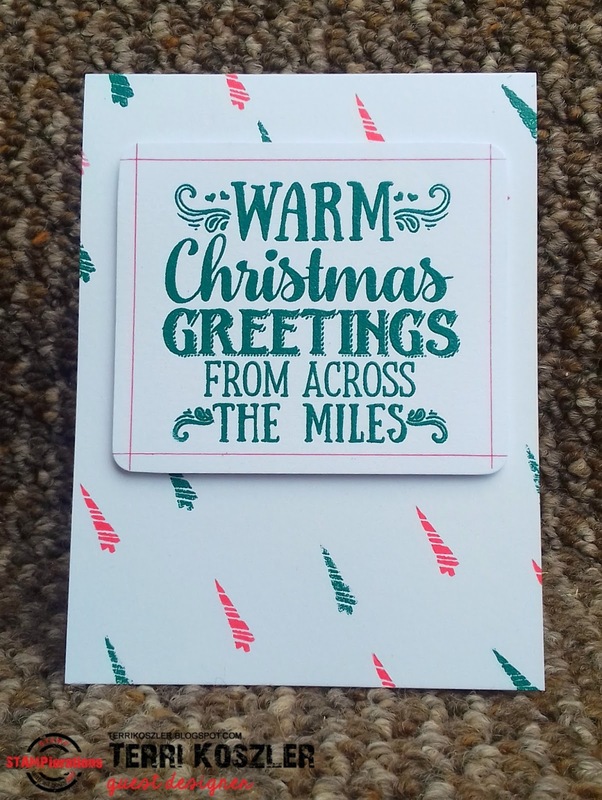 A trio of beautiful CAS Christmas cards! My favorite is the gold embossed! 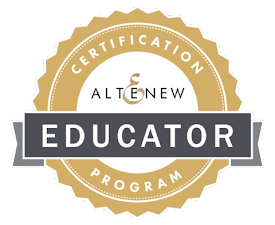 Thank you for the chance to win and all the inspiration! Hugs! wow, so classy, I love big bow and the card in gold.